Kyle Busch has won so many times at Bristol Motor Speedway that the victories are starting to run together. When asked about beating older brother Kurt to the checkered flag of the Food City 500 on Sunday at Bristol Motor Speedway, Kyle forgot about a win here in 2017. "I think I won the spring race last year, right?" Busch said, correctly. "And then he won the fall race (in 2018) and I won the spring race (this year), so that's three in a row." Busch was reminded he also won the Night Race in 2017. "It's four because I won the previous fall?" Busch said. "Hell, yeah! Ha! That's pretty funny. I didn't know that. Busch and Bristol - that sounds familiar." Yes, yes, it does. 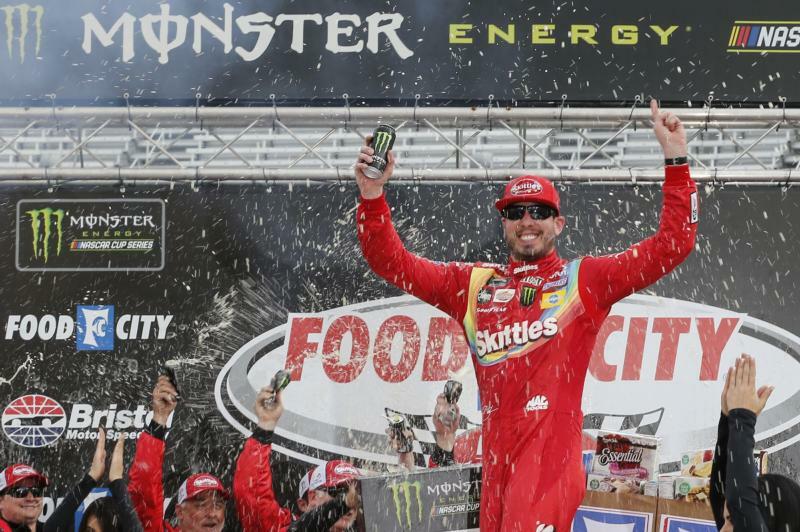 Kyle Busch now has eight victories at The Great Colosseum, tops among active drivers. Between he and Kurt, they have 14 wins at BMS. But if Kurt had his way, Kyle wouldn't have been sitting in victory lane. After Kyle took the lead by not pitting under caution with 18 laps remaining, Kurt slotted into second place. And that meant Kyle had a target on his No. 18 Joe Gibbs Racing Toyota. "I wanted to be closer to my little brother to wreck him on the last lap because I flat-out would have," Kurt said. "He's already got wins this year. He would have figured it out." Kurt told Kyle as much as Kyle stopped at the end of pit road before driving into victory lane. "I told him how frustrated I was and I was going to wreck him," Kurt said. "He said, 'Oh really?' and I said, "Yes, I was.'" Kyle just laughed it off. "I was like, 'You can't tell people you're going to wreck 'em before you do it because when roles are reversed, that person's going to wreck you because you've already told them you're going to wreck them," Kyle said. "So I guess if I'm ever running second to Kurt, I'm going to wreck him. "I'm glad it didn't turn out that way and he couldn't get to me because I certainly wouldn't have wanted to have been in that situation." 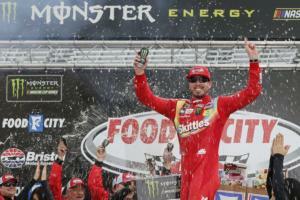 The brothers' 1-2 finish was the second time it's happened for them in the Monster Energy NASCAR Cup Series, coming nearly four years after Kyle beat Kurt in Sonoma, Calif.
"To see him in my mirror and to see him closing in on me, I was like, 'Surely I can't lose this one to my brother,'" Kyle said. "He gave it one helluva fight." The victory was Busch's 54th Cup win in his career, matching him for 10th all-time with the legendary Lee Petty. "It's pretty cool to be able to continue to have the opportunity to go out there and win these races," Busch said. "When you win these races, the numbers will continue to add up. Getting to Lee Petty, you're starting to get into some really heady that's at the top 10 of the all-time wins list of our series and our sport. I feel as though I've just done my fair share and have been with some amazing people over the years that have gotten me to this number thus far. We'll just keep going." Busch didn't have the best car all day Sunday, and his race nearly ended before it really got going. On the second lap, he was hit from behind and spun. Fortunately for him, the car only had minor cosmetic damage to the rear, and Busch began the march back to the front. Meanwhile, Team Penske drivers Ryan Blaney, Joey Logano and Brad Keselowski combined to lead 344 of the first 482 laps. Logano had the lead - getting around Keselowski on lap 470 - when Kyle Larson hit the Turn 2 wall, setting up a decision to pit or not. Logano pitted, restarted eighth and could only get back to third. "I think we had the fastest car," Logano said. "We just didn't get the pieces right. You can have the fastest car, (but if you) don't do the rest of the stuff, you don't win. The 18 capitalized on that. "When you make the pass for the won, there's only a few laps to go, you think you did it. You have to hold off the 2 (of Keselowski), then everything went wrong at the end." Blaney ended up fourth, with Denny Hamlin fifth. Sixth through 10th were Paul Menard, Clint Bowyer, Daniel Suarez, Ryan Newman and Jimmie Johnson. Logano took control on lap 145 and stayed out front for 106 laps to win Stage 2. He beat Blaney to the stage win, with Keselowski finishing fourth. Ty Dillon scored the first stage victory of his career, beating Bowyer by a few feet after a wacky first 125 laps. The yellow flag waved after only three laps after William Byron and Aric Almirola collided, sending Almirola into the wall (and out of the race) and causing a chain-reaction that involved Kyle Busch, Ricky Stenhouse Jr. and Ryan Preece. Busch fought back to battle in the top five, but Stenhouse and Preece sustained enough damage to put them several laps down. On lap 39, Preece spun off Turn 4, and when polesitter Chase Elliott slowed to miss him, Elliott was punted by Corey LaJoie. Elliott spun but didn't suffer any damage, though he developed power-steering problems soon after. A late caution created a two-lap dash for the Stage 1 win, with Dillon holding the outside lane to edge Bowyer in a battle of drivers who didn't pit under that previous yellow. NASCAR returns to Bristol Motor Speedway for the Bass Pro Shops NRA Night Race weekend, Aug. 15-17.